Lately, I’ve been craving comfort food. Comfort food with some health benefits, though. You feel me? Given the arctic temperatures around here these past couple days (yesterday was a high of 9 degrees! ), comfort food cravings aren’t really surprising. What IS surprising, however, is how I’m equally craving things like smoothies and salads. Whenever this happens, I take it as a sign from my body. My body needs those nutrients. But my body also loves cheese. That is an ever-present craving for me. So! Today’s dish is a sort of compromise of all these feelings. Minus the cheese. And actually, I don’t mind! I looooove soba noodles. They’re so vertatile and tasty, and they act as the perfect vessel for whatever flavors and ingredients you want to work with. Just like any other noodle, really, but with some extra built in fiber and protein. 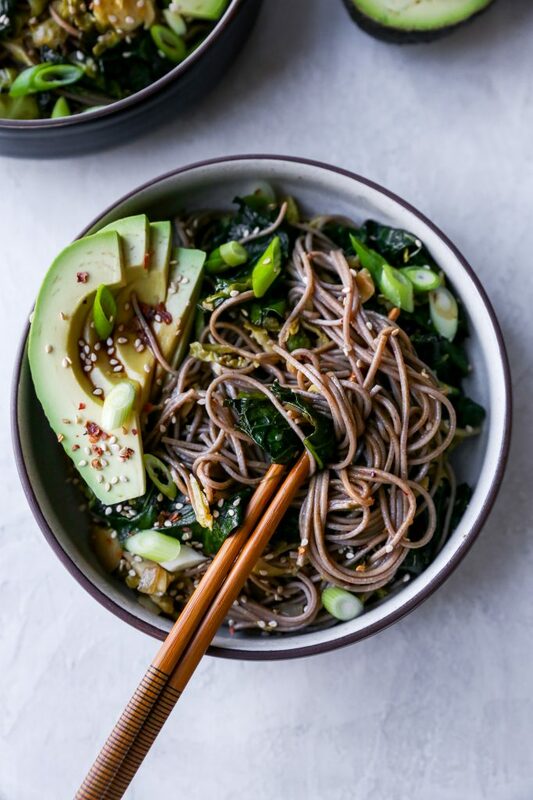 I love making a big batch of soba noodles and eating them through the week. 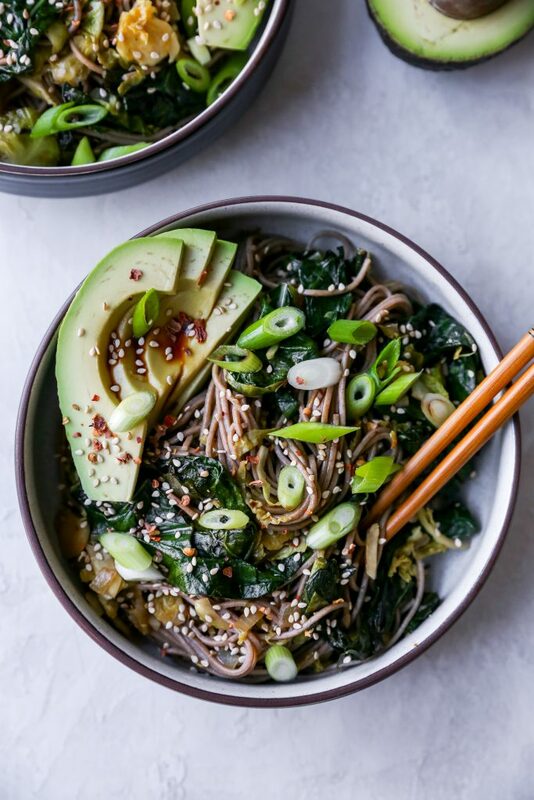 This works well because you can eat soba noodle salads, like this one, warm, cold, or at room temperature. It works for all times of day and all work loads/schedules. 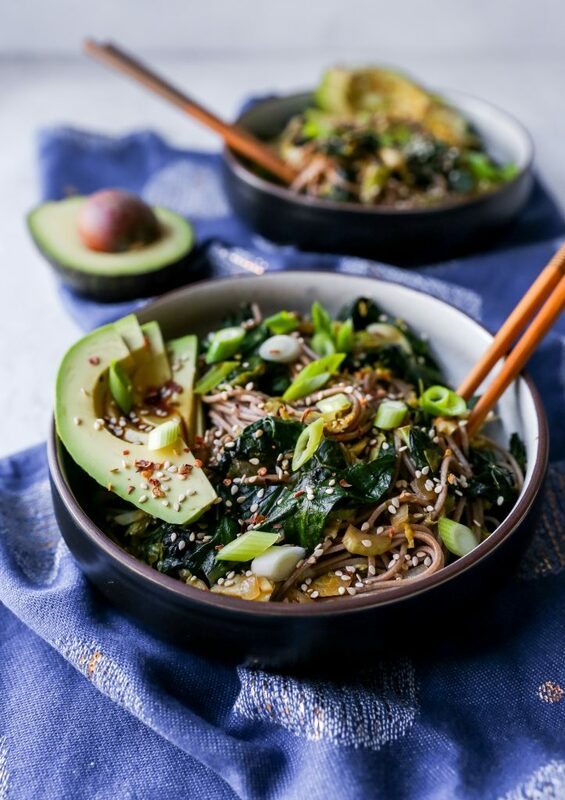 I’m serving this version of soba noodles warm, solely because of the weather outside. Brrr. Warm things only, please! These noodles are tossed in an easy sauce made up of all the flavors: sweet, salty, spicy, nutty, savory. It’s awesome. Then, to enhance the health factor I’ve been craving, I add in kale and shredded brussels sprouts and toss everything together until they’re friends. You can swap in any veggies or protein you like here. This is the ideal dish to make when you need to clean out your crisper drawer! Those carrots or bell peppers looking like they’re on their last legs? Toss ’em in! Have some other greens that need to be used? Toss ’em in! Leftover chicken or shrimp? Toss ’em in! The possibilities are just as endless as the flavor going on here. 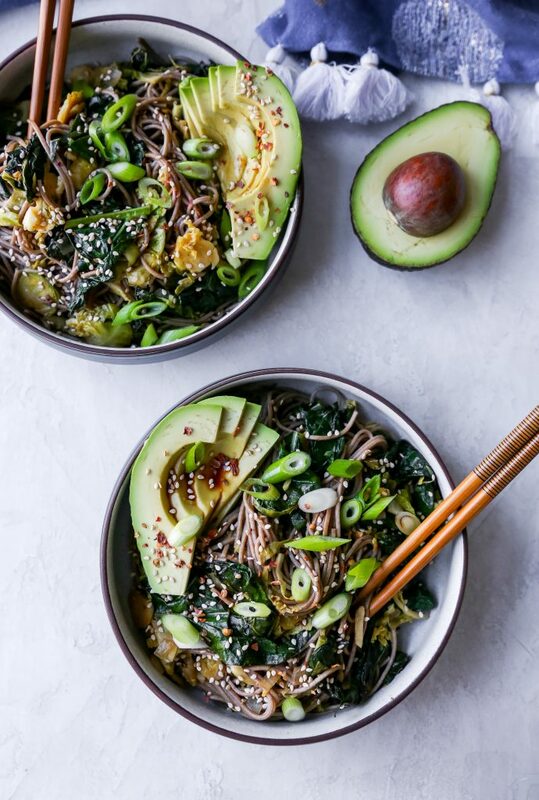 I like to toss the warm noodles and veggies with slices of buttery avocado. It just rounds out the texture experience, makes it taste a little bit more luxurious. I highly recommend this. The best part about this dish? It comes together in 30 minutes or less. Really. 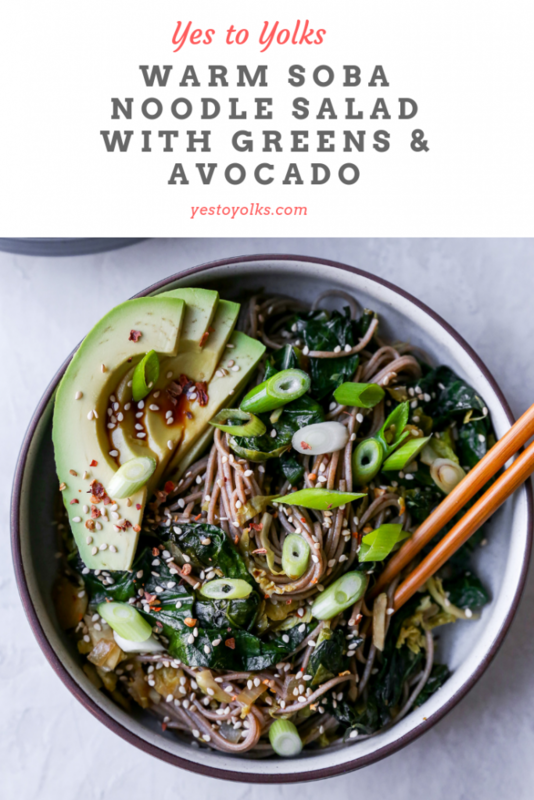 Healthy, fast, and freaking delish. Bring a pot of salted water to a boil for the noodles. Cook, according to the package directions, until the noodles are tender. Drain and rinse well under cold water. Set aside. Meanwhile, heat a large skillet over medium heat and add the oil. Add the shallot/onion, garlic, ginger, and red pepper flakes and cook, stirring frequently, for about 5 minutes. Add in the kale and the brussels sprouts and toss to combine. Add in the vinegar, sesame oil. soy sauce, and honey and toss to combine. Cook, stirring frequently, for a few minutes or until the greens are starting to wilt and the brussels sprouts are tender. Add the cooked soba noodles to the pan and toss everything to combine. Season, to taste, with additional soy sauce, red pepper flakes, or honey. 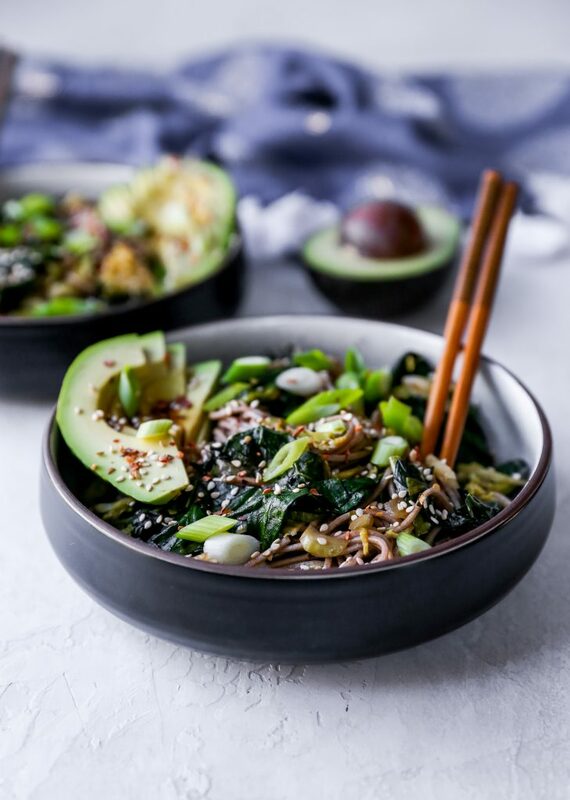 Sprinkle the dish with the toasted sesame seeds and serve warm garnished with sliced avocado. These are delicious warm, at room temperature, and even chilled. Sounds like a perfect alternative to the calorie-laden foods that Most of us resort to at this time of year. Made this tonight and added some salmon on top. So good!! Awesome! It makes me so happy to hear this. Thanks, Lisa!